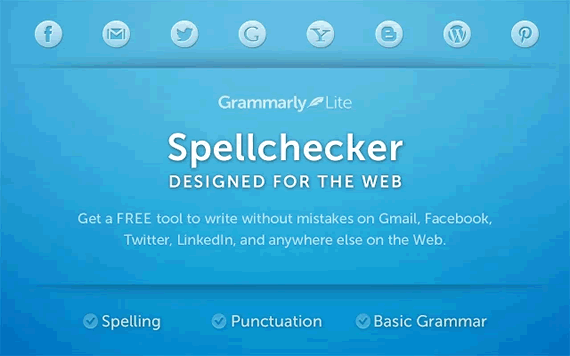 Grammarly Lite is a spell checker for Chrome, Firefox and Safari Browsers. There are several extensions for checking spelling mistakes and Grammarly promises to do better than others by doing some extra things like contextual spell checking. Features of this extension include contextual spell checking Grammar check, Punctuation correction, Synonymous suggestion, Dictionary & Thesaurus. It works anywhere on the web whether you are writing an email, a blog post or updating status on a social network site. Grammarly Lite is free to use and integrates well into web applications and works in the background. It suggests spelling mistakes and synonyms. For example select a word from your writing and it will show you Synonyms for that word and also you can lookup in the dictionary if you prefer. If you are not a native English speaker this extension is quite useful to add to your browser, it will definitely save you from some embarrassing moments.